2. Are the vessel and the crew insured? Each vessel and crew is insured for possible damage. 3. What should I take with me? When going on a boat, you need to take your clothes, items for personal hygiene, towels (can be rented) and medicaments. You should also take some warmer clothes and water-proof jacket in case of bad weather, and you should also pay attention to having shoes on that are appropriate for the boat. You can buy food and drinks in the marine or in one of the shops near the marine. Also, you can provide us your provisonery list and we’ll do the shopping for you (you’ll pay everything on the check in). 4. Where can I leave the car while I'm sailing? Marina Dalmacija has a large and secured parking place, the price is around 40 eur per week. 5. Is it better to spend the night in the marina or in some of the bays? It is definitely better to choose a marina or a small port with electricity, water and other ''perks'' of civilization and it will also be safe in case of bad weather. Also, there are numerous safe and protected bays with buoys to which you can tie your vessel. The least safe way is to sleep in an anchored vessel and we advise you against that. 6. Which currencies are usual for paying? 7. Where does the skipper sleep and do I have to pay for his food? 8. Can we switch crew during our sailing? It is possible, but only if you report this to Navigo. 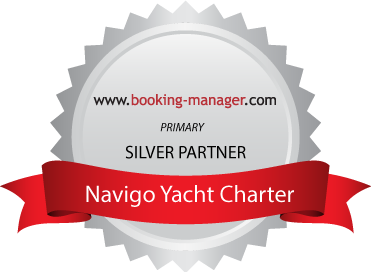 Before check in, you should provide Navigo with a complete list of the crew, the list should include data on citizenship, date of birth and passport number or ID card number so that you would have finished lists for when you need to report the crow to the harbour authorities, you need to keep these lists throughout your voyage. Each change should be reported immediately. 9. When do I need to return the vessel to the base? The vessel should be returned from 5pm on friday. This is necessary so that our staff can check the boat. Of course, you can stay on the boat for the night but you must be ready to leave it not later than 9 o'clock so that it would be ready for the following crew. 10. May I use the vessel before the time scheduled for takeover? The usual time for taking over the vessel is Saturday at 5 pm. In case you plan to arrive earlier, you should let us know about the time of your arrival, so that we can arrange an earlier takeover. In case you plan to set off on Friday, you should book a room somewhere, since the guest who rented the vessel that week are still on it.